In any work environment, we frequently communicate, coordinate, collaborate, and correspond with other professionals. No job is truly isolated. Even if a particular position does not clearly fall under a distinct team, it will always require interacting with coworkers, managers, and subordinates in order to accomplish the job responsibilities. So whether explicitly or implicitly fashioned, teams are an instrumental working mechanism at every company and every organization consisting of more than one person. It is perhaps for that reason that many HR managers and recruiters pay close attention to teamwork and communication skills before hiring someone. Without effective and efficient teams, many businesses would fail to deliver the simplest of projects. Workplaces in the Middle East and North Africa (MENA) region are no different from other markets in this regard; team functionality is extraordinarily valuable for accomplishing the day-to-day tasks, as well as placing the business on the right path. But simply building teams will not get the job done. Team dynamics can be rather finicky and are often influenced by various factors, including their size, leadership, communication style, work division, and many other elements. In order to truly harness the power of teams, there are a few indicators of successful teamwork that every manager should know about. 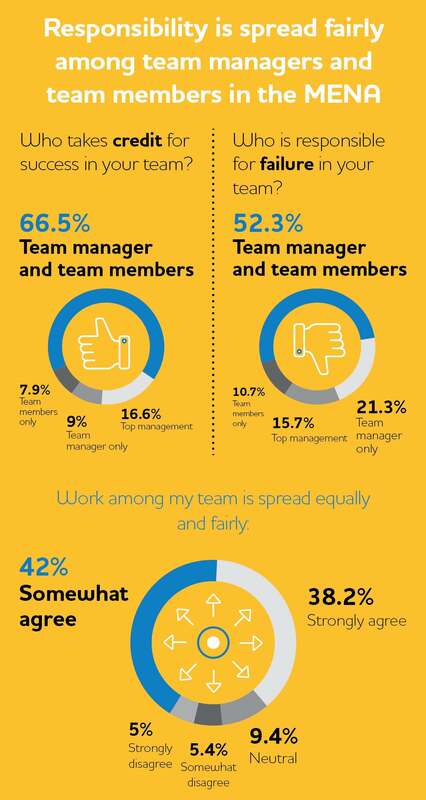 In an effort to comprehend the characteristics and the underlying forces of successful teams in our region, the Bayt.com Teams in the MENA Workplace poll, October 2016, took a close look at teamwork in the MENA. The poll revealed many positive results in terms of team effectiveness and productivity in the region. The far majority of the surveyed teams are successfully accomplishing their tasks, delivering results on time, resolving their conflicts, and maintaining effective performance levels. These results are truly noteworthy as they pinpoint many traits and practices of successful teams, which are summarized in this article. The first thing to note about team size is that there is no perfect size. The number of team members will largely depend on the company size, nature of project, and the required workforce. One of the good qualities of larger teams is their tendency to have more ideas, diverse perspectives, and overall more human capital. However, it is important to know that smaller teams maintain a leg up in this equation. Smaller teams tend to be more cohesive and are often easier to manage. Arranging for meetings, distributing tasks, and taking decisions can also be logistically smoother as an advantage of having smaller teams. Most teams in the MENA are in fact small, consisting of two to five members each. By creating sub-groups based on assigned tasks or area of expertise, large teams can also benefit from the smoother and swifter dynamics, otherwise reserved for small teams. There is nothing more effective in starting a conflict and impeding the workflow of a team than a biased distribution of duties and responsibilities. Dividing work and responsibilities between team members can be tricky and contentious. Nonetheless, it ought to be done in the most equitable manner. Doing so helps in mitigating conflict and results in higher contribution and optimized use of all the resources on hand. In a team where everyone is considered equal and valuable, participation and efficiency are likely to increase. For professionals in the MENA, more than eight in 10 of them agree that work in their teams is spread equally and fairly. What equitable work division also promotes is a unanimous ownership over the outcome: everyone receives credit when the team succeeds and everyone takes responsibility when the team fails. As predicted, this sense of collective responsibility, or accountability, is evident in more than half of surveyed professionals in the MENA. A team without a decisive, skilled, and hardworking leader is deficient. A team leader gives direction and clarity to the team, coordinates between different members, updates and corresponds to management, and generally ensures that the team is on the desired track. Team leaders are also vital because they have the ability to influence other dynamics in the team such as work division and communication. A team leader who is able to make decisions but also negotiate, take responsibility but also delegate, speak up but also listen, work hard but also help others reach their potential, is the ideal type for every team. 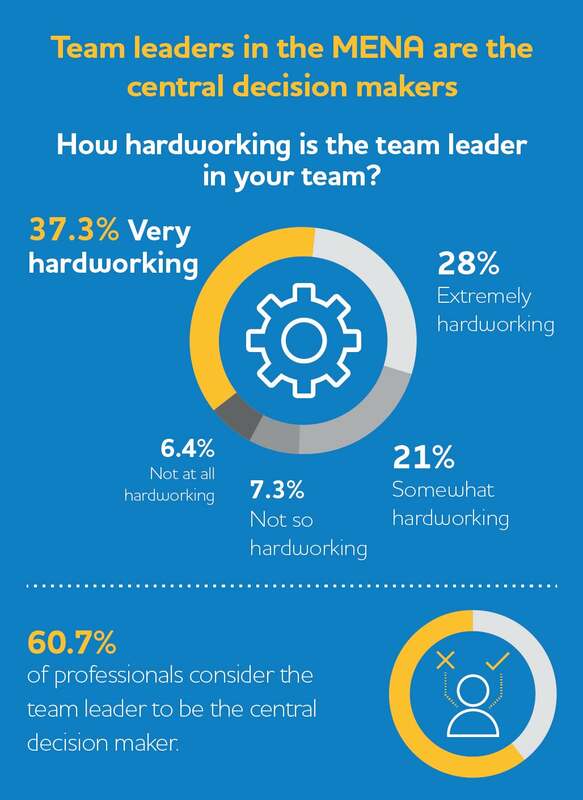 Nearly two-thirds (65.8%) of professionals in the MENA think of their team leaders as hardworking. Indeed, when the team leader is dedicated and serious about his or her responsibilities, the rest of the team will be motivated to perform their best and keep up with what is expected of them. Communication is a keystone for teamwork; without it, teams will be stuck and have no momentum. In order to accomplish their tasks, teams rely on brainstorming, sharing ideas, providing feedback, and continuously following up with one another. There are various channels and modes of communication that can be adopted among teams. But the most important communication style for teams to have is that of openness, transparency, and active participation. Open communication encourages all team members to engage and share their input without being shunned or subjectively criticized. Encouraging more participation means having more ideas and material to work with. 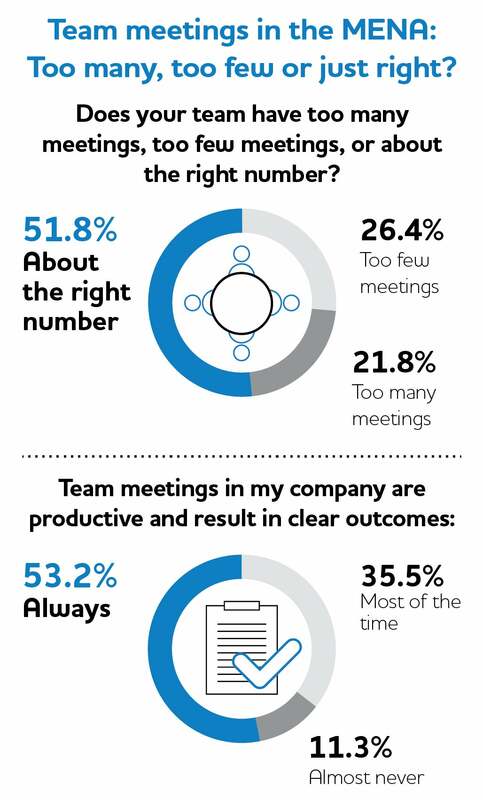 The Bayt.com infographic showed that teams in the MENA have excelled in this aspect, where two-thirds of them (66.3%) are always communicating openly and honestly, and growing together as one unit. It would be unrealistic to suggest that successful teams have no conflict. The truth is, any team is prone to disagreements and disputes. Conflict can help teams consider new points of view, conduct more thorough analysis of their practices and decisions, and sometimes can bring the team together in a stronger fashion. What really matters, though, is the team’s ability to move past their differences and resolve their conflicts in a healthy and productive manner. Conflict should never be a reason to obstruct the work progress and should be dealt with as a quick learning experience. Sometimes, when conflict occurs as a result of interpersonal or non-job related matters, teams are in need of a reminder of the business goals at hands in order to move away from any irrelevant topics. In this regard, teams in the MENA showed a very healthy approach, as 88.6% of them said that they resolve conflicts honestly, quickly, and effectively. Being an efficient team means having the capability to create the highest value out of the given resources and limitations. Teams are always faced with limited budgets and time, which can sometimes create a feeling of frustration. However, successful teams are capable of overcoming such obstacles using their creative side and optimizing what is available to them. With regard to time, for instance, more than half of professionals in the MENA are able to fully utilize their team meetings to increase productivity. Time, being one of the most valuable assets of today’s workplace, is certainly not to be taken for granted. An efficient use of time and similar limited resources, leads to a more impressive success story. In addition to how a team operates and internally handles their daily tasks, delivering the required outcome within the given resources, budget, and time frame is one of the most irrefutable indicators of team success. In the MENA, the far majority of teams (93.3%) are able to meet their deadlines all or most of the time. It is certainly desirable if the team communicates well, resolves conflict, assigns tasks fairly, and encourages everyone to participate. But these dynamics on their own are not sufficient for the company; the team must not fail to complete their projects in a timely manner and show measurable results. The ability to deliver the envisioned outcomes can also depend on the skills and expertise of the team members as well as the ability of the team to work united as effectively as possible. Nearly eight in 10 professionals in the MENA agree that their teams work together effectively in furtherance of the intended business results. At the end of the day, a team that is working together successfully is more likely to have satisfied and productive members. A good way to measure team success and healthy team dynamics is by gauging the team satisfaction level. 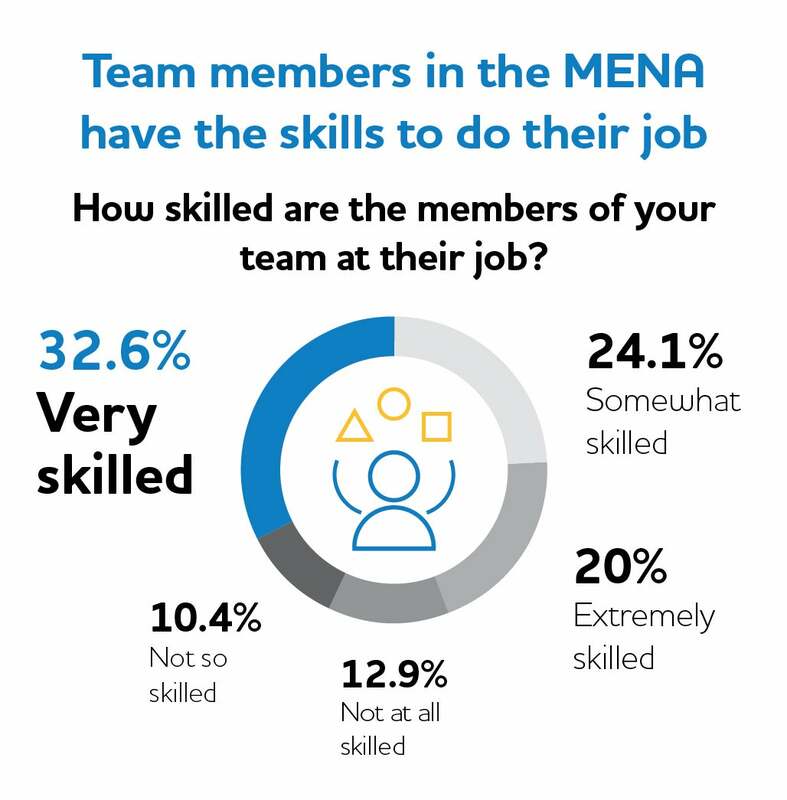 Around two-thirds (62.8%) of professionals in the MENA are happy with their teams at work. Not only does team satisfaction impact the work progress and the accomplishments within the team, but it can also have an effect on the individual’s job satisfaction and performance at work. In fact, 90% of professionals report that teams are a very important part of their satisfaction at work. Happier and more productive teams translate to happier and more productive individuals, and consequently longer strides for the business on the path towards success.